I don't have much time to take photos today... Last weekend I got frustrated with the dungeon my closet. I had started cleaning it, and as I was trying to get a gift bag off the top shelf, a huge plastic box fell and smashed my toe--o.u.c.h! It still hurts! And so, I basically threw everything out the door. The good thing is My closet is now clean, wahoo! The bad thing is, there is a mountain of paperwork and millions of miscellaneous items right outside the door, so you can't get into my closet. Yes, it was a bad idea. I've been working on it all week, but have yet to put much of a dent in the pile. So, after school, that is my goal for today. Say a prayer for me! I thought for today's photo, since it happens to be my brother Sean's 28th birthday, I would upload a photo from when we were kids. It looks like I have very few pictures of Sean... 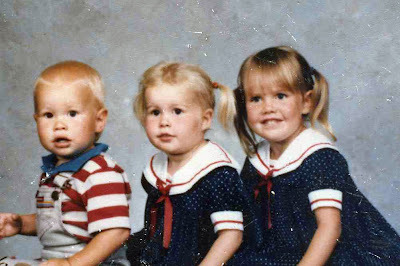 This one was taken back when my parents had only the 3 of us... Me, Jennifer and Sean... and mom actually had our pictures taken! It is old (like us!) and scratched up, but I thought it was cute just the same. I remember when you guys were that age. I remember coming to your house and running up and down the stairs with you. So fun! Love that picture!! I still can't believe you are only 30, wow, you are so mature! You still look like you did there, so cute!! How sweet! Happy Birthday to your brother! AWWWWWWWWWWWWWWWWW!!!!! I LOVE THE PICTURE SO MUCH!!!!!! HAPPY BIRTHDAY SEANY!!!! You al lwhere so cute...way cuter than i was when i was a baby...but as u always told me....when your cute as a baby....yea you know the rest. haha just joking.